Good progress underway at the indoor climbing gym and yoga studio. Any day that a custom steel guardrail goes in is a good day. This new pizzeria in an existing one-story building is slated to start construction this summer in Cleveland. Clean interior lines, simple materials, timeless appeal. Foundations, basement, and first floor framing are finished. 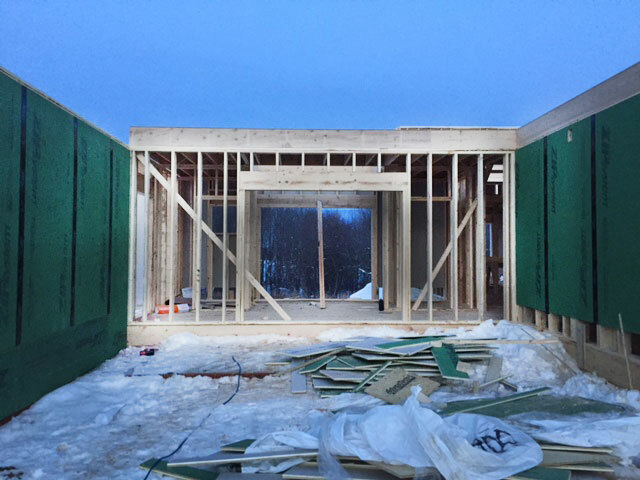 Sheathing is going up and things are taking shape, despite the cold. We love sheds. There's something simple, straightforward, and complete about them. This one by Hufft Projects has the added benefit of translucent end walls. A little eye candy of the Farnsworth House to brighten everyone's day. We tend to do all of our visualizations and rendering work in-house. It would be nice to hire an outside firm every time, but schedule requirements and financial requirements tend to dictate otherwise. Autodesk has a "nifty" way to link a Revit model to a 3dsMax model and automatically update the changes to the model as they are made. No need to worry if the Revit modeling is "done" or "current" because it auto-updates without new modeling in Max. There have been numerous times where we've re-modeled something in 3dsMax just to match changes we've made in Revit. The Revit lights, while probably not totally accurate, render up pretty nicely in Max. I'm sure that by using ALL of the lights modeled in the project it's really increasing render time, but it's nice not to have to trick the model into being well lit, or explain to clients that "well, that's not really what the lights will look like...." when they ask. The materials and mapping seem to come in as a hot mess. Significant work is required in Max to get everything looking correct/good. Ultimately, the goal would be to have the project designed and completed, and THEN export it into Max for tweaking, geometry adjustments, etc. Unfortunately, that is not the world that we work in. Design work continues on a new 3,000 SF residence in Hinckley, Ohio. Work has started at our project at 2190 Professor. Renovations to the existing building are moving forward, and a climbing gym and yoga studio will soon emerge! Stay tuned for more updates as work progresses. Basement view, looking through new floor opening for top-out. First floor, looking into the new opening. I saw this years (12?) ago and it's stuck with me ever since. I try to keep a copy of it on the wall nearby. It's especially good for the moments when I'm stuck, frustrated, or questioning why I just didn't become a banker. Or a barber. To be honest, some of the points don't make much sense until you've messed them up. It's hard to realize that Organization=Liberty (point 30 on the list) until you've found yourself mired in "artistic" dis-organization for a few days. After a long hiatus, we wanted to share the concept work for a new pizzeria planned for the Gordon Square district of Cleveland. Hopefully more good things to come. Saw this a while ago and was immediately jealous of Andrei ( Zoster ) Răducanu. Granted, maybe these took him hours to produce and multiple drafting tools, but I doubt it. It looks reasonably effortless. Whenever I try to do the "thick pencil, wavy line, sort-of-constructed" sketch, it ends up looking blocky, squiggly, and too-constructed. After a lot of thought, care, love, and hard work, the shop is now open. BÚÐIN is a coffee and design shop with a Nordic focus. This means coffee and licorice like you've never tasted before (it's fantastic, by the way), and a range of sweaters, textiles and design goods to drool over. The trio of owners are pretty much all rock stars (one actually is) and made the process a blast from start to finish. It was nice to be in the shop with the construction dust and debris gone, the paper taken off the windows, and customers chatting, working, and drinking. It gave one the sort of feeling a proud soccer-parent must have when their kid is finally out there running around on the field. Get the coffee. Splurge on the good stuff and take the barista's advice on how best to have it prepared (yes, you'll have options). It's like nothing you've ever had, and probably will ruin Starbucks for you forever. While getting the coffee, ogle the espresso machine. It's a ModBar system, and all of the guts are out of sight under the counter. This, of course, is how all espresso machines should be. Equal parts techno-wizardry and magic. After getting the coffee, sit at the bar. It's made from a single slab of salvaged red oak that fell during hurricane Sandy. The boys at J&J studios worked their magic to get it done right. Now that you're into the full Nordic swing of things, head to the back (or the front) and check out the stuff. By stuff, I mean sweaters, teapots, jewelry, blankets, chocolate, salt,...Basically a Nordic general store-full of items in Brooklyn. You'll want to buy it all and change your entire lifestyle. Check out their instagram and twitter for shop updates. Daniel Rozin's "Wooden Mirror" used mechanical and digital means to create stunning effects. His latest, "Angles Mirror" is a variation on that same theme. Part of me wants to say "Great, little spinning lines." The other part of me wants to watch it for hours. Not the safest use of buildings, but one of the coolest.